Five simple scarf patterns for beginners, arranged starting with the easiest, each scarf adding one new technique or twist. The patterns are all written for worsted weight yarn, so beginners can use the leftovers from the beginner's hat to start. But since size isn't a real issue when you're dealing with scarves, feel free to try a different yarn with a similar gauge. Or for a quick knit, try some bulky yarn and follow the numbers in italics. The adventurous beginner can also try changing colors by dropping the old yarn at the end of a row and starting the new row with a different colored yarn. When weaving in ends, twist the two colors around each other once to close any hole that might have formed when changing colors and weave ends into their respective color areas. - fringe = cut pieces of yarn twice as long as desired fringe length and fold them in half; insert crochet hook into one stitch at the edge of the knitted piece and grab the loop formed by folding; pull that loop to the other side, then pull the fringe ends through the loop and tighten; voila, fringe! Using larger needles - size 10,11, or 13, the bigger, the loopier -, cast on 12 st. (for bulky yarn, use US13 or US15 and cast on 8 st.). Work in garter stitch (knit all stitches) until scarf is desired length. Wrap around your neck and be hip! 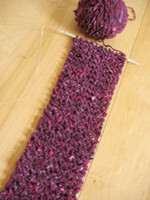 Using a long circular needle (at least 24" long), cast on 220 st. (with bulky yarn, cast on 140). Work in garter stitch (knit all stitches) until scarf is desired width. Bind off stitches LOOSELY (don't pull yarn tightly after making a stitch, otherwise this edge will be too tight). Add fringe if desired (you can incorporate the yarn ends into the fringe!). Weave in ends if you didn't add fringe. Cast on 38 st. (26 stitches with bulky yarn). 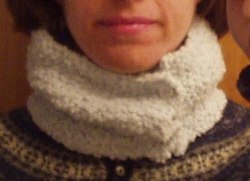 For a skinny scarf, cast on 18 (14 stitches with bulky yarn). Row 1: Work 2x2 ribbing across the row, beginning with K2 and ending with K2. Turn. 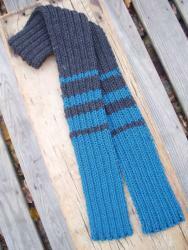 Row 2: Continue ribbing by working stitches as they appear, beginning with P2 and ending with P2. Repeat the last two rows until scarf is desired length. Bind off stitches in rib (if the stitch is a knit stitch, knit it; if it's a purl stitch purl it; pull stitches over one another as usual). Put it on and enjoy!! Cast on 38 st. (26 stitches with bulky yarn). Row 1: Work in 2x2 ribbing across the row, starting with K2 and ending with K2. Repeat the last two rows for 22". Make opening: Work ribbing for first 12 stitches, bind off 14 stitches, continue ribbing over remaining 12 stitches (with bulky yarn, work ribbing for 8 stitches, bind off 10, continue ribbing over remaining 8 stitches). Next row: Work ribbing for first 12 stitches, cast on 14 new stitches over the gap, join to stitches on other side of the gap and continue ribbing (with bulky yarn, work ribbing for 8 stitches, cast on 10 new stitches over the gap, join to stitches on other side of the gap and continue ribbing). Continue working in rib across all stitches for 4 more inches. Bind off stitches in rib (if the stitch is a knit stitch, knit it; if it's a purl stitch, purl it; pull stitches over one other as usual). 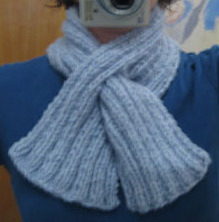 Wrap around neck, push one end through hole on other end and see how stylish warm can be! Work back and forth in garter stitch (knit all rows) for one inch. Make buttonhole: K3, yarn over, K2tog, K to end of row. Continue knitting in garter stitch for two inches (Knit an odd number of rows, so you can make your next buttonhole on the same side as the first). Continue knitting in garter stitch for one more inch. Bind off stitches LOOSELY (don’t pull yarn tightly after making a stitch, otherwise this edge will be too tight). 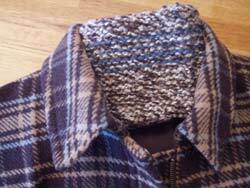 Sew buttons to other end of neck warmer opposite buttonholes. Or try out my orange bliss scarf pattern. Incredible yarn, easy pattern - you'll love it!